We love weekend getaways to Washington, DC in the spring. This year we decided to schedule our trip to coincide with the 27th annual Bark Ball at the Washington Hilton. 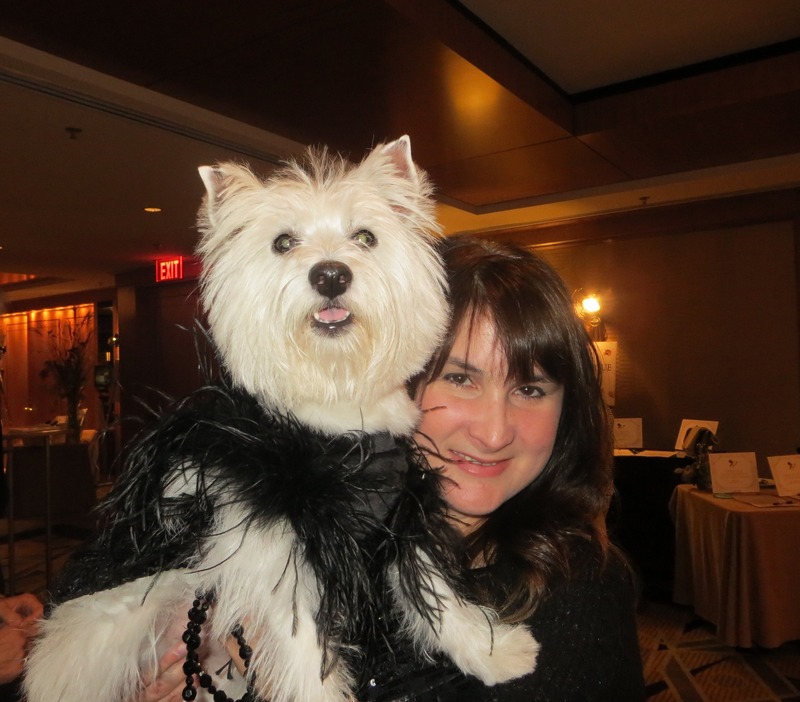 A dog-friendly black-tie party at a dog-friendly hotel in one of our fave dog-friendly cities sounded like fun! The Bark Ball was one BIG party! Over one thousand humans and several hundred pups in one huge ballroom at the Hilton. Outside of the annual Meet the Breeds event, we have never seen so many different breeds at one event! We even saw several Westies, which we rarely see in NYC! A long red carpet led us to the reception room where we found a cute doggy treat and water station courtesy of Barkley Square. After the reception we headed downstairs to a huge ballroom for the program and dinner. 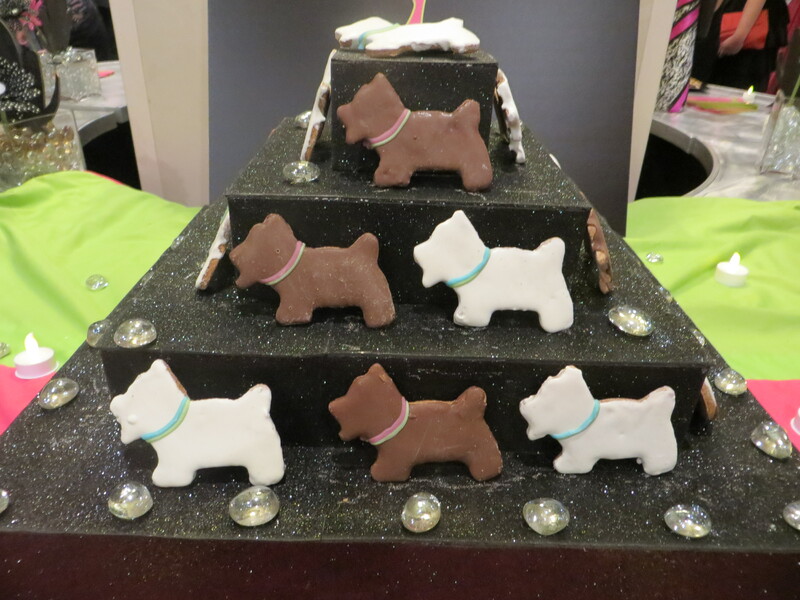 So was the biggest black-tie doggy pawty the best? Not necessarily, but it was fun! We enjoyed a cocktail hour, a vegetarian dinner, and a variety of great silent and live auction items. We somehow missed the dancing hour — probably because we were outside on the Hilton’s dog-friendly patio enjoying the beautiful evening. We will go back! The Washington Humane Society cares for more than 43,000 animals each year. They need a BIG fundraising party to care for that many animals! Our friends at Yorkie911 Rescue were inspired by the cute and extremely talented 4-year old girl who makes Oscar-worthy paper dresses that could be featured on the cover of Vogue! If a 4-year old can make a pretty paper dress, certainly a doggy mom can give it a try! 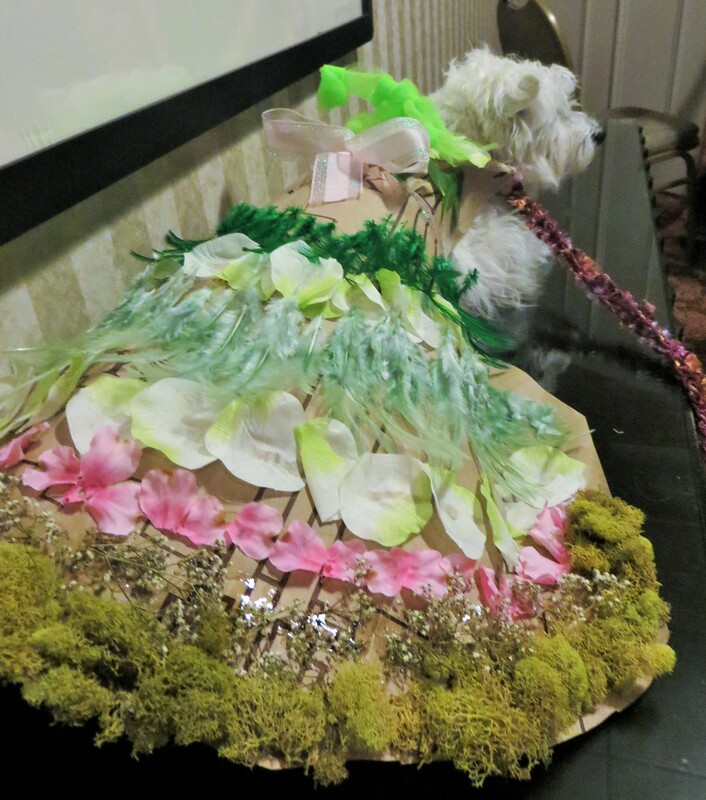 At their recent 5th annual Rescues Rock the Runway charity event at the UpSky hotel on Long Island, Yorkie Rescue event coordinators presented a “designer challenge” and asked doggies to rock the runway in paper dresses. Since we love to support the all-volunteer rescue group, we decided to give it a try. We used an Eataly brown shopping bag and a floral bouquet we had in the house. With a “natural spring” theme, we attached flowers and greenery to the paper bag with Elmer’s Glue. The bag handles made a perfect collar and the stiff paper kept its shape. We used a simple ribbon to tie at the waist. Fun factor: all paws up! The event also featured a fashion show where adoptable and rescued pups walked the runway in beautiful designs from Tuck & Tula, Belle Diva Couture, and Yvette Ruta with Hayley’s Hats. Guests enjoyed a buffet lunch, doggy treats, vendors (the Gerrard Larriett balancing rose spray is amazing), and over 60 pawsome raffle prizes! This is one of our favorite doggy events for a great cause! Funds raised at the event will help the group purchase a vehicle to help transport even more pups. We’re eating Stella & Chewy’s treats while writing this post. Our Rescue the Runway goody bag last night had lots of cool items including our fave, Stella & Chewy’s! Was the second annual runway event as good as the first? It was even better! Barking beauties, BarkBox, Badass rescue groups, and delicious bites — we loved the second annual Mr. Bones & Co. Rescue the Runway fashion show and dog adoption benefit! Held at 91 in the West Village, the event featured adoptable dogs, a runway show, a doggy kissing booth (with a pup named Cubby from Thank Dog Rescue), a BarkBox gifting station, and a great silent auction. Runway escorts included fashion designer, John Bartlett, BarkBox CEO, Matt Meeker, and Erin O’Sullivan from Susie’s Senior Dogs. But we have to admit that we only had eyes for the pups! From a tiny Chihuahua to a beautiful old-soul Siberian Husky, ten four-legged models made their runway debuts and captivated the audience with cuteness and personality. Some of the pups received multiple adoption applications — we hope they all find forever homes! Rescue groups and shelters included Animal Haven, Badass Brooklyn Animal Rescue, and Husky House. Of course there was the requisite tearjerker video. This one showed Mr. Bones & Co. in action with dog rescue success stories from Iraq to the Bahamas to the U.S. Wishing them much success with their future rescue missions, too! If you’re looking for ways to volunteer with your pup, check out some of these ideas. The big game is in town! The Puppy Bowl! To mark the 10th anniversary of Animal Planet’s annual pup game, Discovery Times Square is hosting a cool Puppy Bowl Experience. Mom checked out the exhibit last night at a special VIP showcase. Of course, the VIPs were the very adorable and adoptable pooches! The interactive exhibit runs through this Saturday, February 1 and features a doggy kissing booth, games, a press box, boutique with cute merchandise, lovable adoptable dogs, and much more. 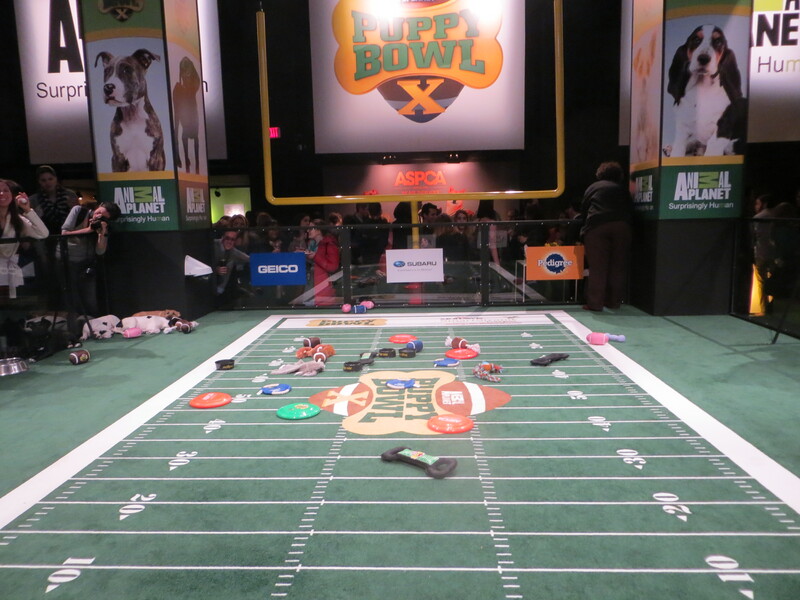 Learn about the history of the Puppy Bowl and watch live puppy play on the field. So cute! Although the event is free, tickets are required to enter. Go to Discovery Times Square for tickets and additional information. We can’t wait to watch Puppy Bowl X this Sunday at 3 pm on Animal Planet! “You are a really happy dog.” That’s what the animal communicator said to me the other night at the SPCA of Westchester gala at the Ritz Carlton in White Plains. “You are grounded and you are confident. You are happy.” Well I was in a room at the Ritz surrounded by food and doggy pals. What more could a doggy dream of? I was HAPPY! My mom brought me to the event to help raise funds for the animals at the SPCA of Westchester. This was our third time attending this event and it gets better every year! I didn’t even mind the dress mom made me wear . . . it was actually quite comfortable and kept me warm. We stalked the silent auction and won two trips for next year! We’ll be heading back to Inn by the Sea in Maine – one of our most favorite places! We also won a trip to Cape Cod at Lamb and Lion Inn – “1 of the top 12 pet-friendliest places in the world” per CNN.com! 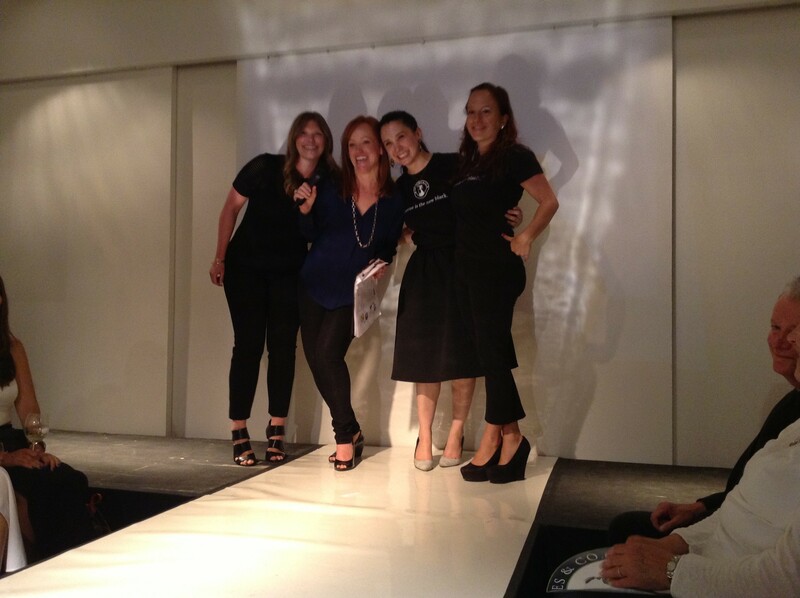 Our friend and role model, Maria Milito, was honored at the event for all of her work helping animals.